Competition is a wonderful thing. As the market continues to react to a push for lower prices from T-Mobile and other cellular service companies, customers are getting more and more economical options. AT&T's latest reactionary price change to its Mobile Share Value plans drops the base price by $15 for single-user plans and family plans with up to two smartphones. That makes the price $65 a month and $90 a month for one and two people, respectively. 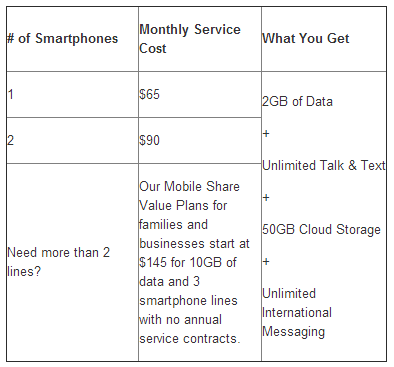 The price breakdown goes like this: the base price for one phone with unlimited talk and text is $40. Add in 2GB of data for $25 (which was previously $40) and it comes to $65. You can add $25 to share all the voice minutes, texts, and data with one family member, bringing the total price for two smartphone plans to $90. These new, cheaper plans will open up to all AT&T customers tomorrow on March 9th, including those who are still under contract or who've purchased a phone with the AT&T Next installment plan. Naturally these prices don't include the additional cost of a Next plan if you're going without a contract, and overage charges are a hefty $15 per gigabyte. According to the press release, the new prices for three smartphones or more on the same shared account will start at $145, but that extra cash will get you 10GB of data to share between all lines. AT&T says they'll offer bigger tiers of data for 1- or 2-phone plans, but at the moment, the Mobile Share Value Plan page shows the old prices, starting at $40 for 2GB and going up quickly. The new plans go into effect tomorrow. If you use only one or two phones on your AT&T account and low amounts of mobile data, you can switch over then. DALLAS, Texas, March 8, 2014 — Last month, AT&T1 (NYSE:T) announced its best-ever pricing plans for families and small businesses and great international offers.2 Beginning Sunday, AT&T will extend savings to customers with one and two lines with the introduction of a new lower priced 2GB Mobile Share Value plan starting at $65 a month, which is $15 off the current 2GB plan for one smartphone with no annual service contract. Additionally, AT&T recently added unlimited international messaging (text, picture and video) to all Mobile Share Value plans for no additional cost. Unlimited international messaging includes messages sent from the U.S., Puerto Rico and U.S. Virgin Islands to more than 190 countries for text messages and 120 countries for picture & video messages. With Mobile Share Value plans, eligible customers can choose to purchase a phone with an AT&T NextSM installment agreement with no annual service contract and no down payment. And with AT&T NextSM, qualified customers can get a new smartphone every year. Visit a store or att.com/next for plan details and conditions. Mobile Share Value plan customers can additionally bring their own device or purchase a phone at full retail price. Customers may also choose from a larger amount of data if needed. With 50GB of cloud storage from AT&T Locker, customers can keep more than 30,000 pictures safe and secure in the network and access them across multiple connected devices. With AT&T Locker’s cloud storage, customers can store photos, videos, music and documents. Customers can learn more about the new plans and determine which plan is best for them from their myAT&T mobile application or by visiting www.att.com/moremobilesharesavings, or, for small businesses at att.com/bizmobileshare.